September is here! On the one hand it means a melancholy feeling because summer is coming to an end and we’re heading to cooler temps. But on the other hand, September is a CELEBRATION OF SEWING! September is celebrated as National Sewing Month and is co-sponsored by the Sewing & Craft Alliance and the American Sewing Guild. In September 1982, President Ronald Reagan signed Proclamation #4976, declaring that September as National Sewing Month. The proclamation recognized the tens of millions of Americans home sewists and “the skill and the self-reliance which are so characteristic of this Nation.” This was followed with successive annual proclamations by President Reagan during his terms. But in 2005, the request for a proclamation was not accommodated. However, even without a Presidential proclamation, September continued to be supported and promoted as National Sewing Month by various organizations. In 2008, the American Sewing Guild joined forces with the Sewing & Craft Alliance to continue the promotion of National Sewing Month and provide a central location for the distribution of National Sewing Month information and materials to organizations, educators, sewing enthusiasts and anyone else interested in promoting and/or participating in activities for National Sewing Month. 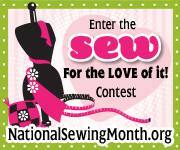 Think about using National Sewing Month in your neighborhood group challenge this month. If you have pictures, be sure to post them to the Members’ Projects album or email me to post them. The National Sewing Month is on Twitter, @sewingmonth. 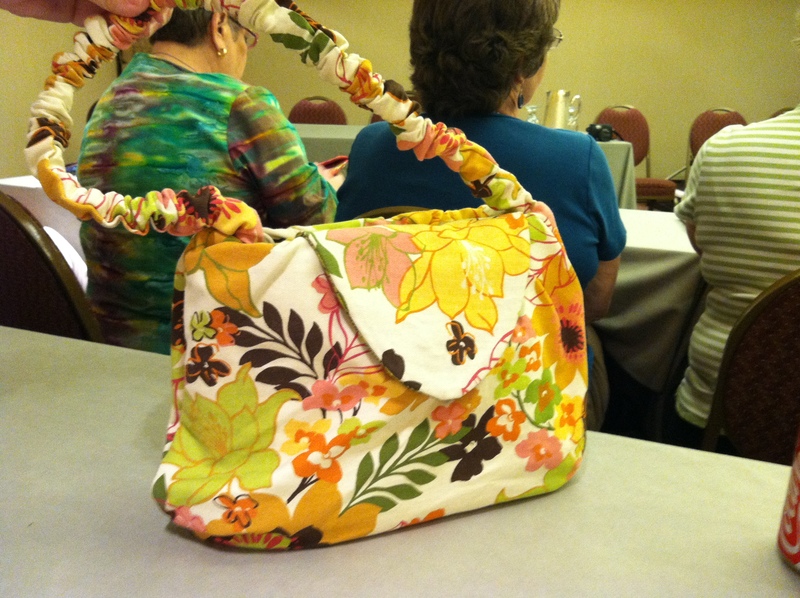 Watch their tweets for daily giveaways and tutorials posted to the National Sewing Month website. Don’t forget to follow us on Twitter, @sewchicago. Watch for our special National Sewing Month tweets with the hashtag “#NatSewMo”. We and other sewists around the Twitter-sphere are using the hashtag to share our enthusiasm for sewing! 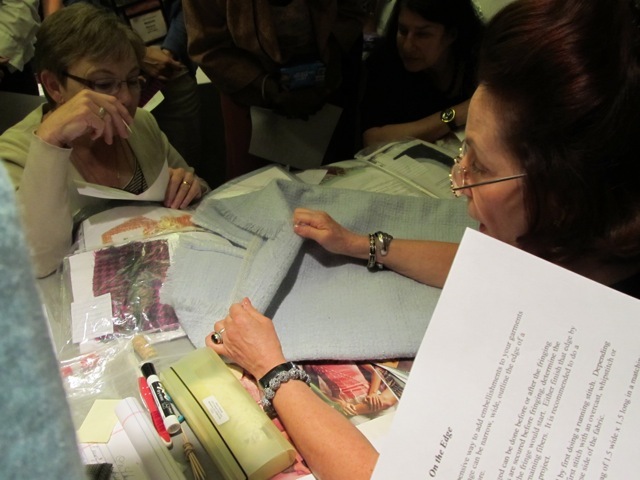 The American Sewing Guild (ASG) held its 2011 annual conference in Los Angeles, CA, from Aug. 18-22. Among the several hundred attendees were a group from the ASG Chicago Chapter. We send a big thanks to National and the L.A. chapter for making this a fantastic conference. Conference mostly focuses on workshops and classes and this year there was a wide variety from which to choose and those were primarily offered in two- to three-hour slots. “The classes brought out your creativity and made you think outside the box. With each one, you walked away having learned something new,” said Mary Ann R.
Here are some highlights from some of the Chicago members who attended. My Purses by Design handbag. Love it! Purse Basics with Pamela L. Day and Roseanne Lauters of Purses by Design held a special half-day class on Aug. 18 that I attended and walked out with a fantastic handbag. Pamela and Roseanne prepped the class by having all the fabric pre-cut and interfaced. All we had to do was insert the magnetic snap and sew. It was a blast. They use a special interfacing for the lining that helps keep the bag stable but flexible. This was one of four classes the PbyD ladies offered. Marie Yolande teaching "On the Edge." Wendy G. said Marie turned a hotel meeting room into a couture atelier. On the Edge with Marie Yolande taught ASG members Wendy G. and Elizabeth H. the beauty of edge finishes and how they can “separate the amateurs from the professionals.” Marie, who has an extensive background in french needlework, showed the class how to use custom piping, shirred and ruched trims, and many other edge techniques. Wendy G. said it was just like being in an couture atelier. It’s almost impossible to list all of the workshops we attended. If you’d like to see who taught, the 2011 conference brochure is still posted on the ASG national website. Some of the others that quickly come to mind are: Christine Haynes‘ Creating Runway Looks at Home, Katrina Walker‘s Sensational Seams, Diane Ricks‘ Washaway Stabilizers, Anne St. Clair‘s Bra Fit. 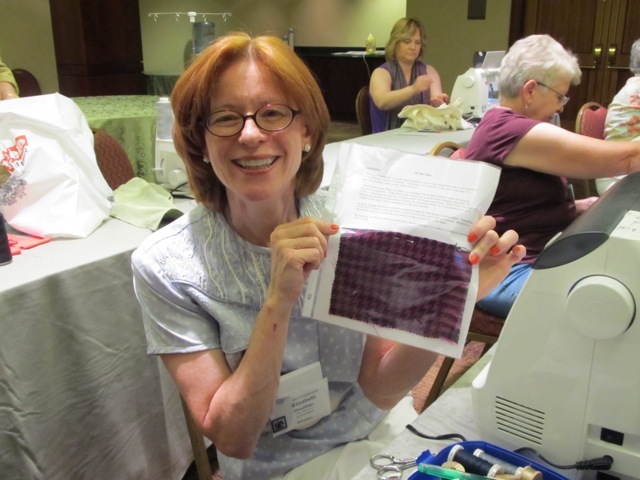 To read more about the workshops, visit Connie’s post As seen at the ASG National Conference or Celeste’s site “Sew Much Fun” for ASG Conference Reviewed. Rami Kim's cathedral window coat. One last class I’d like to mention is Hand Smocking with Rami Kim. She had the class work on two samples and something that seemed so difficult actually was incredibly easy. North American Hand Smocking is a lot of connecting the dots to create the design of your choice. These puckers and pulls of fabric create stunning designs for blouses, jackets, purses, or any item. Rami taught a few other classes on fabric folding, or Chopkey, as she refers to it in her native Korean language. 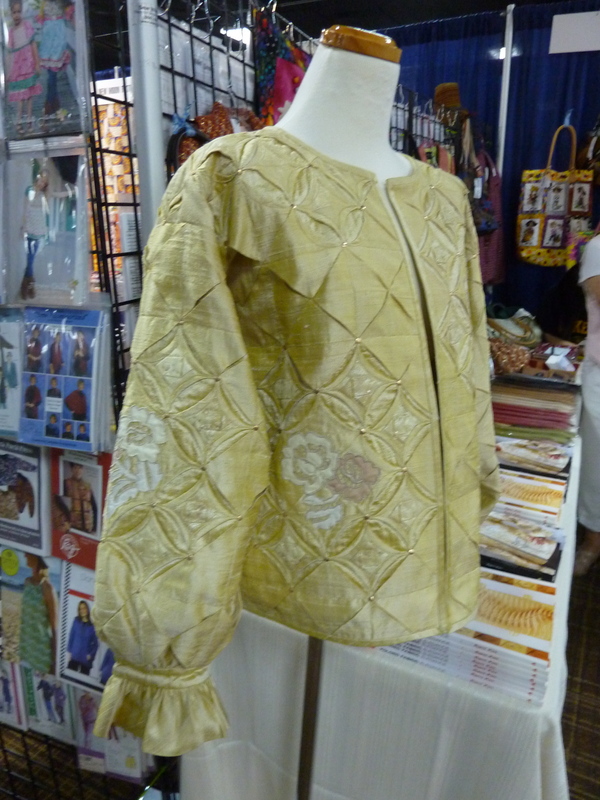 She also displayed a beautiful gold coat done in Cathedral Window pattern. For English Smocking, visit Vaune, one of the vendors at the conference. She had a beautiful selection of fabric and sold pleaters. 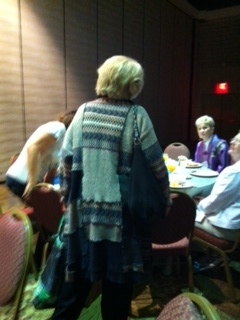 Connie (L) and Wendy (R) with Judy Fitzgerald of Sawyer Brook Fabrics at breakfast. Wendy was thrilled she meet the lady who cuts her fabric and processes her internet orders. A few of us stayed through Monday to take advantage of some of the fabric shopping tours to Santa Barbara Lace and Textile and another to the Fashion Institute of Design and Merchandising (FIDM) and more fabric shopping. The FIDM group was definitely the most packed with three busloads of ASG members. Sharleen and I made it to the bus that started the tour at Mood in L.A. And even thought I don’t have a photo of this to prove it, I do have witness . . . we meet Burt from Project Runway at Mood! He was so nice and posed for pictures with anyone who asked. You guessed it, I didn’t ask to have my photo taken, but I did wish him luck. I could go on and on about the L.A. trip. It was a blast. The 2012 annual conference will be in Houston, TX from Aug. 16-20 and 2013 will be in Arlington, VA. Hope we see you at both! Photos contributed by President Connie G.
The American Sewing Guild National Conference was held in Los Angeles this year. Eleven of our Chicago chapter members attended and filled their days with learning new techniques and meeting old and new friends. Below are some pictures and tidbits that our President, Connie G. sent back. Running In Stitches Neighborhood Group leader Celeste wrote about her ASG Conference experience on her blog. 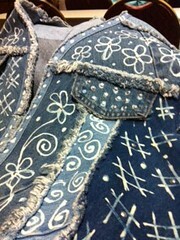 Be sure to take a peek at her jeans-to-skirt reconstruction with the pretty machine embroidery. In Linda MacPhee‘s class, a denim jacket was transformed with dishwasher gel bleach. Use a squeeze bottle to control your lines. Save your squeeze ketchup bottles and use that or buy the squeeze bottles at your local craft store. Linda is also know for her “beggar fabric.” But, beggar fabric is not easy to find. So, Linda made her own by cutting holes in a top fabric and laundering. Then the fabric is backed with a dotted sheer fabric. Beggar fabric doesn’t have to be perfect. In fact, it’s a great way to use up scraps and remnants. Think that twin-needle is just for heirloom sewing? Try this: thread up some colorful thread in that twin-needle and wander your fabric. You’ll create a fun stipple that is perfect for quilting or embellishing a plain fabric. Use fleece as inserts to mimic bias to add texture to your piece. Since fleece doesn’t fray, you don’t need to worry about turning under tiny edges…just cut and sew. With fleece, you can also bend it any which way you desire without worrying too much about grains. Although, keep in mind that some fleece have a nap. 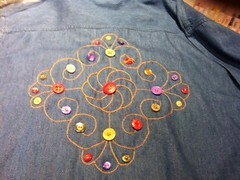 Add dimension to your machine embroidery with buttons! Don’t have an embroidery machine? Use your decorative stitches in rows with variegated thread. Or maybe even try hand embroidery. Do you have a bunch of sweaters that need a new life? You’re either tired of them or they might not fit as well as they used to? Gather them all up and upcycle them into a new sweater. Don’t worry about matching; the idea is to create a patchwork. Use your serger for quick construction…and leave the serged edges to the outside of the garment for additional texture and interest. Go ahead and raid your husband’s and children’s closets…because you’re fabric shopping! Tip: Try to use similar fiber content within one garment. If you mix an all-wool piece with swatches from a cotton/acrylic sweater, you may end up with a shrunken, felted panel at the next wash.
One of the many advantages of the American Sewing Guild National Conference is having access to many wonderful teachers who are known thoughout the sewing industry. Some classes are hands-on, while others are lecture. 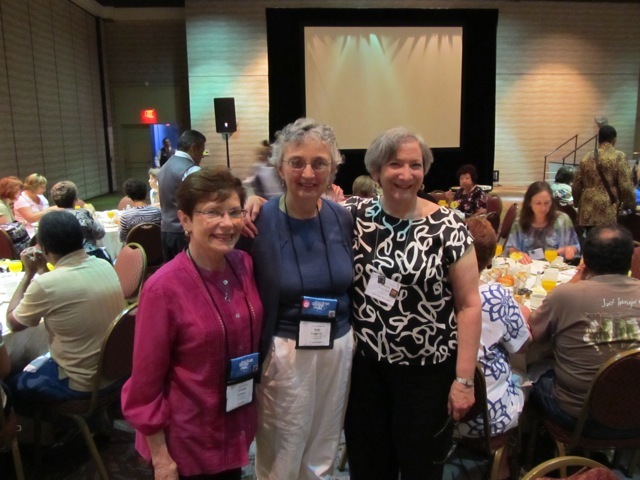 Sandra Betzina and Linda MacPhee were just a two of the instructors that were at this year’s ASG National Conference. Did you go to the ASG National Conference this year in Los Angeles? Tell us your experience, we’d love to hear from you! Dear ASG members and readers, we’ve received a special request from the American Sewing Guild Region 3 to sew new, hand-made first-day-of- school outfits for children whose lives have been turned upside down by the devastating Joplin tornado. Heirloom sewing expert, Susan Stewart, has started a project to help the school children of Joplin, Missouri to make the start of school a happy and hopeful new beginning for them with Project First Day. The goal is to make a school outfit for a child’s first day of school. Susan lives a very short distance from Joplin and would be able to receive the clothing and make sure it’s distributed in time for the beginning of Joplin’s new school year starting August 17, 2011. School is scheduled to start on August 17. Around Joplin, that’s still summer, and the weather is usually quite warm. Sleeveless and short-sleeved garments made from cotton are probably best. For girls, think of simple, pretty dresses, capri-and-top sets, or cute skirts. Peasant-type tops and tunic tops are good for girls who are a little older, and will fit a wide range of sizes .For boys, camp shirts are easy to sew. While the goal is to keep everything primarily hand-made to showcase the ASG sewing skills, you could use a purchased T-shirt and add an appliqué or machine embroidery design to coordinate with a skirt or capris you’ve made. Reminder: pre-shrink the fabric and trims so that the garment doesn’t shrink or pucker after laundering. Lezette Thomason of Children’s Corner Patterns has graciously offered to send a free pattern to anyone interested in using it to make a garment for this effort. She has also written up an instructional sheet on how to modify patterns to better fit plus-sized children. If you are interested, email her at lezette@nashville.net. If you don’t already have children’s patterns or you can’t wait for Lezette’s pattern, here are some patterns that are available free on the Internet. Most of the patterns that are easily found are for younger girls. Not sure what size to make for children’s clothing? Here are Simplicity’s measuring charts for Girls/Girls Plus and Boys/Teen Boys. Please send your finished the garments directly to Susan Stewart at the address below by August 1, 2011. [edited] Please include a simple, personalized note to the child who will receive your garment to the child recipient. It can be a simple wish for a good school year with your name or your ASG Chicago neighborhood group name. Please write the note onto cardstock or something more sturdy than printer paper and safety-pin the note to the garment. Please also indicate the size of the garment on the back of the card. Please consider if you can help. If you do, we’d love to see pictures! Feel free to email or add them to our Flickr album! I love to make what I call “no-fear” projects. Basically, they are projects that you really can’t go wrong, but if you do make a little boo-boo, no one will notice. Have no fear to try this project. British textile artist, Jan Tillett, for Colouricious demonstrates how to make pretty lacy bowls from thread scraps, candy wrappers and water-soluble facing in this lovely video. This is one of the few videos I’ve seen that is not only clear, but shows a beautiful end-result. It must be very easy to make, too, because if you listen to the background, Jan Tillett must be at a tradeshow booth to demonstrate this project. I like her tip of cutting the excess facing so the water doesn’t become too “gloopy.” Enjoy! Let me know if you try this with your bits and bobs. You can follow Coloricious on Twitter at: @Colouricious. Are you following us on Twitter, @sewchicago? I’ll admit that before the press release from the Royal School of Needlework’s about the lace on Kate Middleton’s wedding dress, I’d never heard of “Carrickmacross lace.” So, kudos to Kate Middleton’s wedding dress; the resurgent interest in sewing and the needlearts; and the public’s interest to know details about every minutia, that schools such as the Royal School of Needlework and the type of embroidery and lace detail was mentioned right alongside with wedding dress designer Sarah Burton’s name. Carrickmacross lace is a type of needle lace. 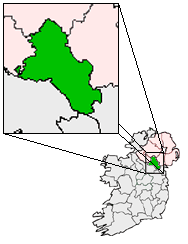 Originating in the 1820’s in Carrickmacross of the County Monaghan in Ireland. It evolved from some of the appliqué lace acquired by a Mrs. Grey Porter, the rector’s wife, on her honeymoon to Italy in 1816. Fortunately, this technique did not die out as other art forms did, due in part to the local St. Louis Convent. The nuns still teach this needleart today. 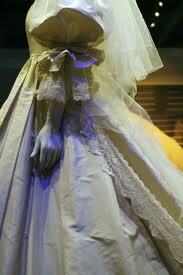 The lace is worked by tacking fine muslin onto machine netting. The design is outlined, the unwanted muslin is then cut away and the open areas are filled in with needle lace. When this process is complete the excess organdy is cut away revealing the design. A further effect, called “guipure,” also a feature of this lace, is achieved by linking areas of the pattern, creating a very intricate design of open work. Colorful terms are used to identify the extensive range of stitches which enrich and embellish the pattern — bars, pops, cobweb, etc. Carrickmacross lace is sometimes confused with Limerick lace, which does not use the cutwork. What we weren’t able to see in the Duchess of Cambridge’s wedding ensemble was her three petticoats of hand-embroidered lace and embroidered shoes, also embroidered by the Royal School of Needlework craftsmen and craftwomen. Princess Diana’s wedding dress sleeves also featured Carrickmacross lace, which was handworked by the Royal School of Needlework. This next link is a wonderful video with close-ups of Carrickmacross lace samples from The Virtual Textile Museum. The narration is in Italian, but pictures speak a thousand words. If you’re in County Monaghan and interested in seeing more Carrickmacross lace, then a visit to the Carrickmacross Lace Gallery will surely be on your must-see list. Send us a postcard if you do visit the Carrickmacross Lace Gallery! This week, the Material Girls NG in Long Grove asked themselves the question: You’re about to go on an RV trip with your spouse or other; and there is room for your sewing machine and a book for the trip. What one or two books would you take along? The variety of book titles and the topics of the book are a great example of the breadth of an American Sewing Guild neighborhood group. From pattern design and fit to embellishment and some very special books. Such fun! Thanks, Material Girls! Happy Reading and Happy Sewing!